The bloody Brunch Club is holding another of their epic brunches on Sunday 1st May at Stage 3 in Hackney, complete with Bloody Marys (3 to choose from), cooked brunch (4 to shoose from), plus DJs and more. Tickets are just £21, and there are two sittings, starting at noon and at 2pm. Sign me up! Well, we say forget Monday, because Sunday is the new Saturday anyway... And even more so this time round because it's a bank holiday! 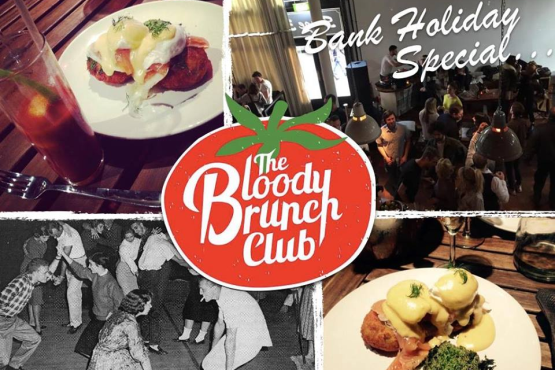 So what better way to continue the weekend than with a selection of gourmet brunch dishes, alongside some of the finest Bloody Mary's in London. All this accompanied by an eclectic mix of both classic and rare Soul, Funk & Reggae hand-picked by our dance floor filling Brunch Club DJs. - 1 of 3 TBBC gourmet Bloody Mary's. In addition, just to really help you ease into that Sunday vibe… we’ll be screening a few classic childhood films from decades gone by on the big screen, plus making sure you have your fix of Sunday papers from the comfort of your table. The bar area will be open from 11.30am until 7pm. Accompanied by a basket of home made pastries to get you warmed up for your brunch feast. - The Full Bloody English: Sausage, bacon and black pudding wellington, free range poached eggs, bubble and squeak, home made baked beans, slow roasted cherry tomatoes on vine, ciabatta. - The Bloody Vegetarian: Free range poached eggs, flat field mushrooms with parsley crumb, bubble and squeak, home made baked beans, slow roasted cherry tomatoes on vine, avocados, ciabatta. - Eggs Bloody Benedict: Free range poached eggs, cured and braised pork belly, bubble and squeak, shaved fennel, picked dill, hollandaise. - Eggs Bloody Royale: Free range poached eggs, Scottish smoked salmon, bubble and squeak, shaved fennel, picked dill, hollandaise."